These last two voyages were the most difficult for me, and I suppose it comes down to the intensity of the schedule, and my propensity for sea-sickness. The experience of sea-sickness just cannot be described in any decent way to anyone who has not been sea-sick. You can list the symptoms (headache, nausea, vertigo, lethargy, painful awareness of the impossibility of escape) but the sum is equal to more than its parts. Some sunrise or sunset, somewhere...these pretty sights help with the recovery process quite a bit. But such an experience does lead a little adventurer like myself to ask some pretty confronting questions during those wee morning hour watches. What will I do if I never overcome my sea-sickness? What will I do with all of my dreams of world travel across oceans on sailboats? How stubborn am I really? Stubborn enough to live permanently in the world of dizzying, miserable, punishing sea-sickness? The real answer, much as I hate to admit it, is no. I’ve lived a good portion of the last two months in that state, and I have finally reached my limit. 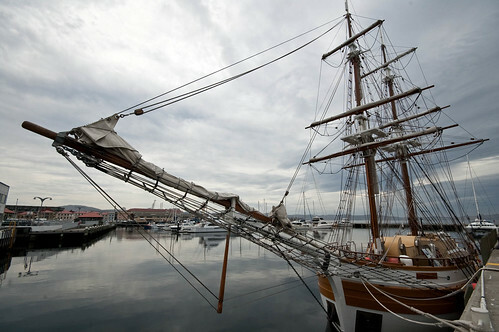 My plan now is to tie up my commitments here in Tasmania, go home, get myself back on a schooner, and enjoy some coastal sailing for a little while. One of the many reasons I LOVE working on traditional boats is the nature of the work that is required to maintain them. Splicing, whipping and seizing line is high on my list of favorite activities, and the other day I got to do some. I was lucky because it was a beautiful, sunny day and someone was playing tunes on a fiddle on the boat berthed next to us! You can’t do anything but sit back and enjoy in moments like those. Here are some shots I took to give a general idea of how to keep the end of a line from fraying by securing it with a whipping. I just came across this beautiful little piece entitled Cape Horn to Starboard, by Lin Pardey, who has been sailing around the world with her husband Larry for decades. I continue to feel encouraged by reading of other very experienced sailors’ expressions of fear and worry about their adventures. It’s been easy at times to wonder whether I’m “cut out for this”, after experiencing extreme anxiety during rough weather at sea. At the beginning of my season sailing up in the Channel Islands of California last year, we ran into a pretty decent gale with a dozen and a half 15 year old’s on board. In all honesty, I can’t really say how bad of a storm it was. The important part was that it was the worst weather I’d seen, and my first real experience of having to respond to the cascade of events that often accompanies rough weather. When we finally got home after spending over 12 hours in this gale (a relatively short time, in retrospect), I called up Angus for some serious life advice: was pursuing this career really the right choice for me? This is a shot of Yellowbanks, the anchorage we chose to wait out our gale, just hours before it hit. Angus’ efforts to bolster my confidence were varied: he listened sympathetically to my rambling, repetitive play-by-play; he told me he thought I’d be fine; he challenged me to tell him I wasn’t tough enough; finally he told me I needed to shut up and stop being a baby. And yet I whined. The sentence that shook me back to my senses was: “Katz, you’re more passionate about this than anything else in your life. You owe it to yourself to just give it another try.” So I did. As I read more essays and books by life-long adventurers, I realize that fear and anxiety just go with the territory. It’s pretty normal, and actually, I think that’s a big part of why we do it. So in a way my crazy compulsion to chase after something that strikes fear in my heart is what makes me a member of the tribe. The only thing that determines whether or not I’m “cut out” for this lifestyle is…my own choice to go after it, or not. Not all adventures require a purpose, but this one did. I have a Grandmother who lives in Hobart, Tasmania, and she wanted me to visit. Deciding to go wasn’t tough once the opportunity came up, and deciding to prolong my stay was easier. Why travel to the other side of the world and only stay for two weeks? One of the great advantages to working on boats, besides the fresh salt air and gorgeous views, is the built-in flexibility in employment with regards to length, location and type. It seemed immediately obvious to me that if I wanted to stay for a few months, I should find a tall-ship to work on while I was in Tasmania. Even if I couldn’t get paid work, I’d be compensated with room and board. Fine by me. 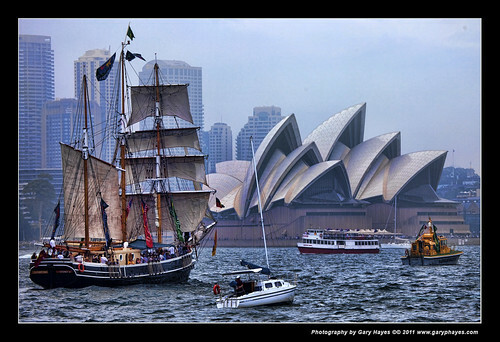 I began researching tall-ships in Australia about a year ago, when I decided to take this trip. This was as simple as Googling “tall-ship Australia”, but keep in mind that many boats escape detection with these seemingly all-inclusive keywords. If you’re looking for a boat, especially if it’s in a specific place, don’t assume your first search will turn up every single one. In fact, the boat I ultimately joined didn’t appear on any of my searches. Some other good search terms include: sailing, cruising, sail-training, schooner, square-rigger, windjammer, traditional ship, wooden boat, traditional rig, sailing crew, deckhand, etc. As well, Tall Ships America and Sail Training International have vessel member lists/databases. Be sure to check these out too, but again, don’t assume that they cover everyone. Of course having an up-to-date resume on hand is essential, and being an obsessive resume updater myself, I have a lot of tips on that which I’ll save for another article. Go ahead and just send your resume out with a cover letter to everyone you come across, even if they’re not advertising openings. It can’t hurt. I sent off my resume to the half-dozen tall-ships I came across online, and didn’t get any replies. No worries. Not surprisingly, Captains are often offline for days or weeks at a time. If you are persistent, you’ll find your ship. What finally got me my position aboard Windeward Bound was, of course, networking. Once you decide upon your adventure, don’t ever pass up an opportunity to mention it to someone who has even the slightest potential of taking an interest. You never know where the connection will come from. 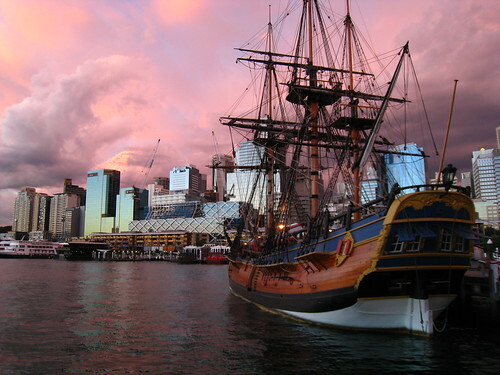 Mine came from my Captain on the Bill of Rights, Stephen Taylor, who just happened to have a friend that does business in Tasmania, and loves tall-ships. I sent this man my resume, and honestly within two days he’d written me that he found me my boat, and had already contacted the Captain on my behalf. From there it was just a few emails back and forth between the Captain and I, and my position was settled. Now that I’m in Tassie, I’m beginning to work towards my new goal of finding a boat to take me home to the States via the Pacific. This brings me to my final bit of advice for today. There are a million boats out there, and just because they’ve invited you to join, doesn’t mean you should. Different sailors have different standards for safety on the water. Find out what yours is, and don’t settle for a situation that makes you uncomfortable. When I’m looking for a boat to join, I’m evaluating the disposition and experience of the Captain and crew, the type of equipment on board, the state of the gear, and even how tidy their galley is. The smallest detail can tell you a lot about your potential crew-mates and future home. And for my first ocean crossing, I’m happy to wait until I find the right situation. One of the thoughts I had when creating this blog was to make it a resource for people who are captivated by the idea of an adventuring lifestyle on the sea, and want to know how to make it happen. I did not grow up on the water, and until I was 20 had never myself experienced what has now become the predominant force in my life: the thrill of being driven through a frothy chop, sails tight against a steady breeze, with the sun happily bearing witness to this greatest of partnerships between man and nature. And yet, HERE I AM, preparing to embark on another boat-based journey, once again following this passion to a new part of the globe. I’m not saying that this life is easy, comfortable or lucrative (although parts of the industry certainly are). It is, however, doable…if you truly want it. Can I get a job on a boat without experience? The answer, as you might expect, is absolutely yes! 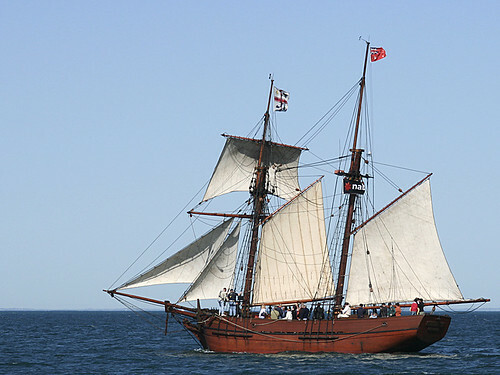 I got my start on Traditional Tall-Ships, and for people without any experience on the water at all, I think that this is a great place to get your start. It’s definitely not for everybody, but as a launch pad, it has a lot of advantages. Since it’s where I have almost all of my experience, I’m going to start here. The goods: Tall ships are a great place to learn, and are a relatively easy industry in which to find work. Many are operated by non-profits that specialize in education, and thus are perfectly suited to train newbies. Plus, they often can’t pay very much, so they’re always looking for enthusiastic new recruits! Camaraderie is the name of the game on these traditional boats, not only because of the serious teamwork required to make them go, but because of the hardships you’ll certainly have to endure together. So if you’re looking for a “professional” community to welcome you with open arms, this is it. The questionables: The pay, as mentioned, is often pretty low, although room and board is almost always covered. 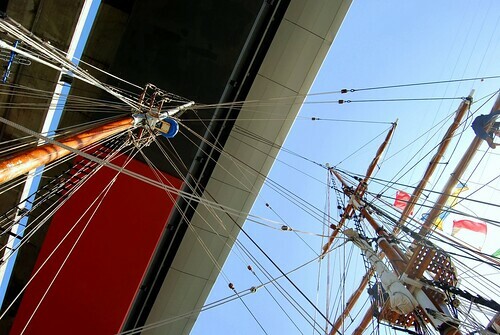 The culture, to some, can seem quite base (best not to be easily offended by swears or bodily functions), and, ironically, also stuck-up (try to tell a tall-ship sailor the right way to do anything!). The most important caveat that I would give anyone getting their start on tall-ships is: Don’t think that being able to crew a tall-ship means that you know how to sail. To really understand sailing, you’ll eventually have to find your way to a small boat, and sail it yourself. The connections: Here are some websites that have become a standard part of my seasonal tall-ship job-search. My best advice at this point is to explore, inquire and check back often! 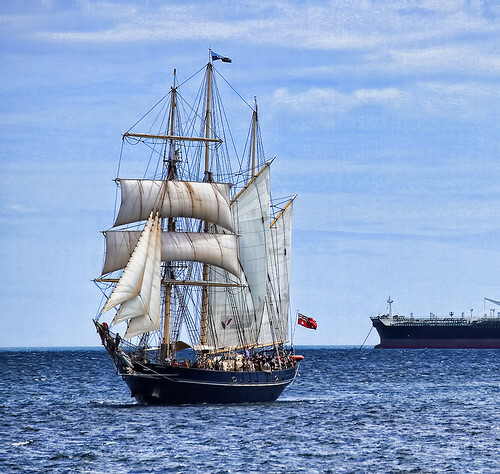 Tall Ships America Billet Bank: This is the best resource I’ve found for hunting jobs on tall-ships. When you’re in the heat of the search, check this daily! Maine Windjammer Association: This website contains links to 13 of the almost 20 schooners (and one ketch!) that operate in mid-coast Maine June-September. Apply in January. Spring outfit usually starts in April. The Maine coast is one of the most beautiful and interesting places to sail in the world. So, that’s all I have for now. Other sailors: any thoughts to add?